Whooping cough is a highly contagious infection of the respiratory tract caused by the bacteria Bordetella pertussis. The disease spreads through droplets in the aire when an infected person sneezes or coughs. The first signs of infection are a runny nose and cough, which quickly becomes more frequent and intense. 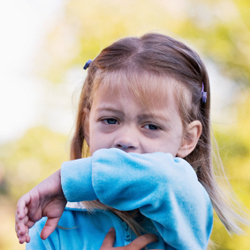 In children, severe episodes of coughing often end with a "whoop" sound produced when the child tries to take a breath, hence the name whooping cough. During such episodes, the child's face may take on a bluish colour, and vomiting often follows. Whooping cough is more serious in children under one year old, who often need to be hospitalized for treatment. Symptoms usually last six to ten weeks. What can you do to protect yourself and your child? The best way to protect yourself against whooping cough is to get vaccinated. See the "Whooping cough" fact sheet on the Ministère de la Santé et des Services sociaux (MSSS)’s website. It is recommended that children be vaccinated once they are two months old, to protect them at the time when they are most vulnerable. Several doses are required to ensure good short- and long-term protection. Since 2004, teenagers in the third year of high school are given whooping cough boosters. Teens and adults who have not received boosters should contact their doctor or CLSC to bring their vaccinations up-to-date, especially if they are in contact with young babies. See the "Whooping cough" page on the Health Canada website, where you will find all sorts of information on the disease, its health effects and symptoms, and effective means of prevention like vaccination. Whom should you contact for more advice and information?